Next week it’s Easter and to celebrate the occasion Kaboo Casino offers you a special promotion and the fun is already going on. Until Wednesday the 12th of April, also known as the day before Maundy Thursday, you will be able to go on a special Easter egg hunt at Kaboo. By collecting Easter eggs you will also claim Echoes that you will receive every day during the Easter weekend 2017 – between the 13th and 17th of April. The more eggs you collect the more Echoes you will get. 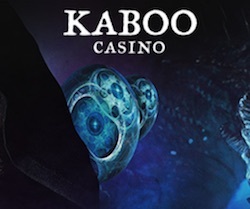 As always Kaboo will give you the chance to make an exchange with your Echoes and you will get free spins in return. These bonus spins are of course also free from wagering requirements which means that you can make a withdrawal whenever you feel like it. The big egg hunt is already up and running at Kaboo so make sure you join the adventure before it’s too late. You have until Wednesday the 12th to grab as many eggs as you can. If you haven’t started yet it’s time to collect your first and second egg which will give you a total of 25 Echoes/free spins during Easter. To lay your hands on your very first egg at Kaboo you will have to wager real money on the following video slots: Golden, Double Dragon, Phoenix Sun and Twin Spin. After that you can go get your second egg by playing Beauty and the Beast, Jungle Spirit: Call of the Wild, Chibeasties 2, Jungle Jim and Gold Lab. You’ll find all the instructions you need at Kaboo if you want to get more eggs. There are ten eggs in total and if you collect them all you can look forward to 50 Echoes a day – 250 free spins in total! Today is the 5th of April and there’s another great offer waiting on you at Kaboo Casino. You can make a deposit before 23:50 tonight and get bonus spins on a very new slot tomorrow called Hong Kong Tower provided by ELK Studios. If you deposit £20 you will receive 10 spins while a deposit of £30 gives you 20 free rounds and a deposit of £60 will give you 50 spins. Next Tuesday there’s a new offer available at Kaboo. By then you can make a new deposit and get either free spins or some smashing Super Spins on the latest video slot from Quickspin called Sakura Fortune.